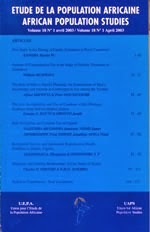 Vol.26 no.2 of African Population Studies has been updated on Bioline. This issue features a number of articles, including "School enrollment in the Democratic Republic of the Congo: family economic well-being, gender, and place of residence" by Mabika & Shapiro. This study looks at how the enrolment of children in Democractic Republic of the Congo in schools is affected by the demographics of children's families. The study also examines how political and economic issues experienced by the country affected enrolment at those times. Qualitative data from 1999 was used to examine school enrolments of youth 6 to 24 years of age. A great thanks to DR.INEGBEDION the man that help me when i was very sick, i and my husband where HIV positive and my little daughter had it too, I have try all my possible best to get cured but I couldn’t come up with anything, am from Congo married and Lives in USA I have gone to different hospital but no cure, when i discovered i was losing my mind because of thinking i will die soon, I informed my family back home in my country, they feet bad, but told me about a cure in Africa, they gave me the contact of DR.INEGBEDION, i contacted him and asked him what he can do for me to get cured, he told me what to do, and whats requested for the cure, that I should give my details to him and the man requested for items for the cure i and my husband provided everything to him on the evening of it he called me and told me what to do after two weeks i and my husband went for test and we where tested negative, is close to five months now theres no week i dont go for test just to be sure am okay, but all the results shows am perfectly fine, you can email him now through drinegbedionspellhomes@gmail.com or drinegbedionspellhome@outlook.com or call him on +2347063628174 or add him on his whats-app number at +2349051177568.